In the late '80s, Pollard recorded songs and constructed artwork and track lists for several LPs that never saw the light of day. This collection helps unearth some of those gems. contains 2 cuts from the aborted GBV LP Learning to Hunt, 5 tracks from the also scrapped LP Back to Saturn X, and 11 songs that were at one time included for possible inclusion for the final cut of Bee Thousand. !!! Put on your mining hats and get ready to do some historical digging through the GBV back story. We’ve Got Airplanes- 4 Mid-tempo, hazy ‘60s hippie-rock but put through the fuzz wringer, and splashed with a touch of punk attitude and pop nostalgia. Controlled and irresistibly bright pop. Dust Devil- 3 Slightly prog-tinged basement pop. Big escalating choruses, recorded on the tiny side of the scale. Sounds like a song that would have been made epic by some of Doug Gillard style contributions. Squirmish Frontal Room- 3 Noisy, paranoia psych rock. Heavy and twisted, with super distorted vocals. Fun nightmare trip to take. Great piercing, lead guitar riff. Tricycle Looper- 4 Noisy stomp, with clear, speak-sing vocals over no-fi noodling and pulsating rhythm guitar. Sounds like a ringleader leading a psychotic circus behind him. Crutch Came Slinking- 5 Shades of “Echos Myron,” in this song. Mid-tempo early’ ’60 head-bop pop, complete with “ooohhhs and ahhhhs.” Compact innocent pop (complete with surreal Pollard lyrics), to put in your backpocket. Fantasy Creeps- 2 Fairly run-of-the-mill shrug worthy pop instrumental with psychotic Pollard drawl over said music. Makes for an interesting pairing of words and music, but it’s fairly forgettable. Sopor Joe- 3 Slow, stoner rock with vocal delivery that sounds like it’s being projected from a warped record on a dying hi-fi. Manages to remain poppy throughout it’s slow molasses drip. Crunch Pillow- 4 Tobin Sprout fuzz-pop. Sounds like it’s broadcast from the broken transmissions of a dream. Predates Neutral Milk Hotel, but perhaps Mangum learned a thing or two from this song. Indian Was an Angel- 5 Acoustic song with dual vocals, singing a infectious melody over said guitar strums. Almost too easy, but yet quite brilliant. Simple, haunting, and endlessly catchy. Don’t Stop Now [original version]- 4 Completely rickety early version of the UTBUTS classic. Cryptic, and beautiful, and beautifully simple. That buzzing string gets me every time. Bite- 2 Curt, loud, and extremely lo-fi. Pretty forgettable. Greenface- 5 OH MY GOD! What a song. 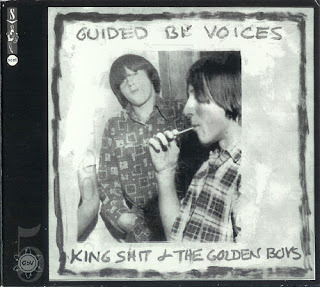 Place the headphones on, turn your stereo up and listen to one of the most inimitable GBV contributions ever caught on tape. Death-psych rock. Surreal, pissed off, strung out song, shrouded in a thick layer of bong-resin and post-apocalyptic hangovers. Deathtrot and Warlock Riding a Rooster- 4 Completely silly piano bouncer sung with dual harmonies from Pollard and Mitch Mitchell. So completely insane it’s (arguably) borderline genius. 2nd Moves to Win- 2 Slow, distorted pop contortion. Toe-tapper with buzz saw riffs, while Pollard rambles. It's always been a struggle to find much to grasp on to with this awkward, rather improvised song. At Odds with Dr. Genesis- 3 The full version of what was the beginning of “Ester's Day,” off Bee Thousand. Completely bizarre, with completely dreamlike, wizardry lyrics. So ridiculous and unsettling that it’s rather enjoyable. Please Freeze Me- 4 Simple, excellent, acoustic ditty. Catchy in it’s vocal delivery. Overall melancholy. Scissors- 4 Grunge ‘50s rock, with ‘60s harmonies delivered by Tobin Sprout. Grand and sloppy. Woozy melodies for the hazy summer. Postal Blowfish- 5 Rarely has something so good come from something so little. Essentially one chord carries the entire song, verse, chorus and all. Buzzing with attitude and distorted guitars. Classic crowd pleaser. Crocker’s Favorite Song- 3 Out of all the songs in the cannon, this was Crocker’s favorite? Ehh, not the worst. Turns out, this was an early sketch for the song "Class Clown Spots a UFO" off the LP of the same name. Anther version of this would pop up on Suitcase 3, under the name "Class Clown Spots a UFO," as well. Acoustic picking and spacey Pollard vocals from what seems to be another realm is the makeup of this song. Saddened drivel that’s kind of forgettable in the scheme of the great and encompassing GBV song empire.